Summary: The UK military is very poorly equipped at present because of the MoD’s appalling procurement processes. However what they are trying to procure is completely inappropriate for the sort of missions that the MoD needs to be able to manage in the very near future. An earlier piece analysed the problems being generated by existing procurement plans. This piece takes a look at what sort of hardware we need to start investing in as a matter of urgency. Unmanned vehicles in the air, on land and at sea have enormous advantages by not having to take humans with them. They become much lighter and cheaper to make, very much easier to maintain and above all do not put valuable soldiers, sailors and airmen at risk. The rest of the world is already developing these craft and the British MoD must accelerate its work towards using them. A recent posting on outsidethebubble.net drew attention to the extraordinary lack of serviceable equipment available to the British Armed Forces. We have no aircraft carrier, and no aircraft to fly from it. We expect serious problems in recruiting and training enough pilots in the time available. Our destroyers are non-functional and our submarines are all in port. You can read more here: http://outsidethebubble.net/2017/03/16/britain-defenceless-in-the-21st-century/ . Trident is another significant problem addressed separately here: http://outsidethebubble.net/2016/09/16/trident-the-third-way-make-do-and-mend/ . Following the US strike on Syria with 59 cruise missiles it is interesting to note that the UK could not have taken any part in this. All its cruise missiles are on nuclear submarines and all these are presently in dock for maintenance and repair. Apart from the horrendous problems with MoD procurement and plans, the most worrying feature of the plans is just how badly suited they are to the likely defence requirements of the UK in the 21st-century. It is often said that across the world, the military equips themselves to fight the last war, and that is clearly the case with the British plans for the future. One of the reasons for the immediate success of Germany at the beginning of the second war was that they had equipped themselves for the war that was going to be fought. We must not be caught again like that. The UK is building two aircraft carriers for £14.3 billion that could be sunk by a couple of cheap long-range Chinese DF-21 missile with a range of 1100 miles and top speed 10 times that of sound. The new DF-26, often referred to as Beijing’s “carrier-killer” has a range of 2500 miles. They were designed to sink an aircraft carrier, all the aircraft on it and the crew which may be several hundred strong. These are not ballistic missiles that anti-missile systems would be defence against. They fly low and fast and would be almost undetectable until they were too close to avoid. Then the UK plans to buy 138 F-35 fighter aircraft from the US for both the Navy and the Air Force at a price in excess of $100 million each. Again a single well aimed missile is all that need to destroy that plane, and kill the very expensively trained pilot. The total cost of an aircraft together with the pilot, the training, many years of training flights and associated maintenance, plus all the support systems is probably approaching $250 million each. Our six Type 45 destroyers, even once their current problems are fixed are also highly vulnerable to the same missiles that would take out our aircraft carrier. The destroyers are so noisy they can be tracked by submarine from over a hundred miles away. We are also planning Type 26 Global Combat Ships whose specification is still being continually ratcheted up, but are already over £350 million each. Again another of those cheap missiles will do the trick. The list goes on and on. Apparently what hasn’t occurred to the top brass in the MoD is that future battles and future missions will not be fought like this at all. We all know that road vehicles are close to being genuinely driverless. Modern airliners have very sophisticated autopilots that can also undertake virtually everything needed to fly an aircraft without human intervention. The future is undoubtedly with unmanned vehicles. The way they will be used will be very different and very much more economic than present weapon systems. Already the UK uses pilotless drones as in the movie “Eye in the Sky” (2015, with Helen Mirren). These systems are known as “man in the loop” vehicles because the drone is controlled remotely by ground crew. However a great deal of research is already underway to produce aircraft that can work semi-autonomously. Each would have a considerable amount of artificial intelligence but need approval or direction before making key decisions. The next stage are fully autonomous vehicles. These have their decisions both navigational and tactical made by pre-programmed software and mission parameters. Such a machine could find and carry out the operation without external direction by human controller, although tests human intervention is always possible as the operator is permanently aware of what is happening with the vehicle. Many would find this scenario rather scary but that doesn’t stop the development of systems like this by others all round the world. It simply cannot be ignored. The UK traditionally hopes to punch well above its weight in foreign and defence matters so must make sure that its military systems are the most appropriate for the next mission, whatever that might be. We must put aside any thoughts of hero boy pilots as in “Top Gun” and “Star Wars” movies. That is not how future battles will be fought. It will be between computer system and software systems, technologies that the UK has traditionally excelled in. It will make systems dramatically cheaper and yet much more capable. It will give much better performance and capability for the same money. The key difference with unmanned vehicles of all sorts, in the air, on the ground and at sea is that they don’t have any people on board. This has many advantages, particularly as the public becomes increasingly squeamish about deaths on the battlefield by our soldiers. However there are many further advantages if a vehicle is unmanned. A great deal of the space and weight of a vehicle is a consequence of having to accommodate real people. There is a limit to what real people can cope with, matter how well they are trained. An aircraft cannot do an incredibly tight turn during a dogfight because of the G-force effects on the human frame. Just having a pilot in an aircraft means providing all the control systems, pressure suit systems, ejector seat etc. plus all the limitations on the engineering of the aircraft needed to keep the aircraft fully operable by a human. Already fighter aircraft can largely fly themselves and it is often said that the pilots job is principally to bring it back safely should it become damaged. In the future it will be the computing systems that will do the work and do a much, much better job. Finally it becomes significantly less critical to return the vehicle at the end of the mission undamaged, particularly if that vehicle is so much cheaper. The consequence is that an unmanned fighter aircraft with much the same performance as a manned one is predicted to be between 1/5 and 1/10 of the cost. In addition, there will be no need to have practice flight after flight to train the pilot because the craft will be flown by the computer. They can sit in the hangar and be checked from time to time on the ground. They will be operated by ground-based staff that can program its mission and monitor how it carries it out remotely. The total cost is such that it is realistic to expect to be able to buy 10-20 times as many craft for the same price if they are unmanned. It also appears that the best strategy is for these craft to work in groups, with different craft configured differently with different sensors, weapons for defence and attack and other capabilities. However all would be communicating between one another so each benefits from the capabilities of all the others. With so many eyes on what is happening to the group, defence is much easier to manage and dealing with the target much harder for the enemy to defend against. Craft can spend days flying at much greater altitudes than manned aircraft, flying slowly on patrol because the pilot does not need to get back for dinner and to sleep. A very comprehensive look particularly at unmanned aerial vehicles but also at other aspects of operating unmanned aircraft can be found here: http://tinyurl.com/jyg7jgl . 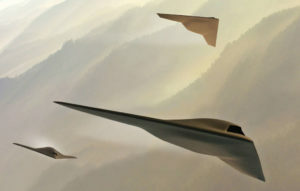 BAE Systems and the UK MoD have already developed test drones such as the Taranis. Many others are in development around the world and, in the US, conventional fighter aircraft have been retrofitted to make them fully autonomous (a good thing to consider for the U.K.’s Tornado fighters once they approach the end of their planned service lives: they could also be automated and kept running at a tiny fraction of their present cost). There are similar advantages at sea. Craft can be much smaller, lighter and faster, able to spend long periods away from base and ultimately by being expendable much more capable of managing missions that might otherwise be too dangerous for human crew. An Israeli company is developing a Seagull unmanned surface vessel capable of minesweeping, antisubmarine duties and as support ships. On the ground small tank-like vehicles (Themis Adder) have already been developed by an Estonian company called Milrem that makes ground operations radically different and safer for the troops working with them. More can be found here: http://tinyurl.com/kzrd6wr. The bottom line for all this is that by moving much more enthusiastically towards the use of unmanned vehicles in the air, on the sea and on land would make the British defence budget go much further but above all be much more capable of carrying out the military missions we need to be able to participate on in the future. At present there is relatively little sign of serious activity by the MoD towards such vehicles. This must not be thought of a long term development plan. Procuring autonomous unmanned vehicles for use in the air, at sea and on land is now an urgency. Other nations are already moving ahead rapidly on this. We will get much better bang for our buck if we embrace this new generation of technology wholeheartedly. A great part of those activities are truly defensive, making sure that threats to the UK from rogue nations, great and small, can be managed. The offensive aspect is also important should it come to that. When we recall just how poorly served we are by our present massively dysfunctional military we can see how much still has to be done.